The National Research Institute for Cultural Properties, Tokyo was entrusted with conservation work of the great Buddha of Kamakura in Kotoku-in temple. In this work, for the first time in 55 years after the major conservation in 1959, the noble statue is enclosed by the scaffolding in order to perform recording the present condition, cleaning, metal analysis, climatic investigation, microtremor measurement, investigation of the seismic isolator, and high-resolution image photographing. With regard to the Great Buddha of Kamakura, the National Research Institute for Cultural Properties, Tokyo was also involved in gamma-rays transmission photographing that was implemented during the major conservation in 1950s, and the sampling analysis relating to copper corrosion as well as the environmental research that were implemented in 1995. In this work, it was scheduled that the surface rust was analyzed for the first time by means of the non-destructive analysis method such as XRF (X-Ray Fluorescence analysis) and XRD (X-Ray Diffraction analysis) and further detailed damage record was taken, based on which we expect to accurately know details of the current preservation state. The scheduled work also included checking of the condition of the sliding base isolator that was installed as earthquake countermeasures at the time of the major conservation in 1959. On January 15th (Friday), the Modern Cultural Properties Section of the Center for Conservation Science and Restoration Techniques held a study meeting titled “Conservation and Restoration Philosophies for Modern Cultural Properties” at the Institute’s seminar room. The study meeting was featured by four guest speakers: Mr.Rorf Hoehmann (Owner and Head of Office of Industrial Archaeology), Dr. ITOH Takashi (Chairman of the Japan Industrial Archaeology Society), Dr. KIMURA Tsutomu (Professor, Nagaoka Institute of Design), and Dr. SUZUKI Jun (Professor, The University of Tokyo). Mr.Hoehmann made a presentation on the conservation and restoration philosophies for industrial heritage in Germany. Dr.ITOH spoke on the conservation and restoration philosophies for each of three categories of the modern cultural properties that included Architectural Heritage, Civil Engineering Heritage, and Industrial Heritage. Prof. KIMURA made a presentation on the current situations and problems of modern cultural properties that are observed through the efforts in conservation and restoration of modern western-style buildings. Prof. SUZUKI, in view of his expertise in industrial technology history, told about the necessity of conservation of heritage, because we can find the history of technology from such heritage. The lectures were all very convincing as they were based on practice, to which the audience listened in an enthusiastic manner. As many participants indicated in their responses to the questionnaire conducted after the meeting, we also feel it important to further deepen discussion on the issue of conservation and restoration philosophies not on an ad hoc basis but on a continuous basis. Aiming to contribute to deepening discussion, we will make further efforts to promote our research study. Study Meeting on Records of Preservation Activities for Disaster-Affected Cultural Assets. 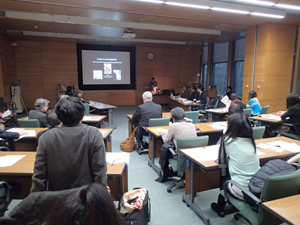 The “Study Meeting on Records of Preservation Activities for Disaster-Affected Cultural Assets.” was held on January 29, 2016. It was held as a part of the “research study for establishing the system of risk management and disaster prevention of cultural properties” now worked on by the National Research Institute for Cultural Properties, Tokyo under the promotion project of the National Taskforce for the Japanese Cultural Heritage Disaster Risk Mitigation Network implemented by the National Institutes for Cultural Heritage. From the past till now, a large volume and a wide variety of recorded materials have been produced with regard to preservation activities for disaster-affected cultural assets, including on-site activity reports and meeting/communication records among concerned parties. These materials tell us problems they faced and provide us with clues for a perspective on future activities. With this in mind, the study meeting consisted of presentations on how the past records on preservation activities were kept and being utilized, followed by a discussion on potentiality of the activity logs. The study meeting started with a report on collection and public release of materials that recorded an actual catastrophe (disaster-related materials), which was followed by reports based on a viewpoint of storage and use of activity records. Those reports were on activities of the Historical Records Network and the Committee for Salvaging Cultural Properties after the Great Hanshin-Awaji Earthquake, activities of preservation of local historical records and collection of materials relating to the evacuation centers following the Niigata-ken-Chuetsu Earthquake, and activities of the Japanese Council of Art Museums after the Great East Japan Earthquake. In the following session, there was an active discussion on how records are positioned in the preservation activities and how records of preservation activities are treated from the standpoint of the study of disaster-related materials. In the field of preservation activities for disaster-affected cultural assets, not only the study from the aspects of techniques and systems but also continued discussion on the past activity records should be necessary. Through these activities, we hope to contribute to protection of historical culture against disasters. During a period from January 7th to January 18th at the Bagan Ruins in Myanmar, we conducted training on preservation/restoration of murals and temporary conservation work associated with the falling mural at No.1205 Temple within the Bagan Ruins. This was the last survey/training that was performed under the Networking Core Centers for International Cooperation in the Conservation of Cultural Heritage Project that had been entrusted by the Agency for Cultural Affairs, Japan. The training programs consisted of lectures on the mural pigment analysis with X-ray fluorescence analyzer, photographing the exteriors of the Temples using a UAV (Drone), and the 3D model production technique (SfM, Structure from Motion) using the pictures obtained, as well as the discussions held at the mural conservation work site. The training was attended by 4 expert staff members of the Department of Archaeology and National Museum, Bagan Branch and Mandalay Branch who were engaged in preservation and conservation of mural paintings and architecture. The attendees commented that they would like to use what they learned in the training also in other conservation projects and we also expect such future utilization. At one conservation work site where the survey team visited, the team saw that the particular method to adjust conservation materials that had been instructed in the past training was then in use and thus realized a favorable effect of the training. Further, with regard to the falling of the mural paintings at No.1205 Temple, all the temporary conservation works that had continued since 2014 were completed. Through the survey under this project, it was confirmed that roof leakage was one of the main factors that caused damages to mural paintings and the importance of taking appropriate measures against it was re-recognized. It is expected that the results of the survey and training under this project will continue to be utilized in mural paintings conservation in Bagan. The Japan Center for International Cooperation in Conservation has been making efforts to protect cultural heritage in danger under conflict or in post-conflict situations, including the activity for protecting the Bamyan ruins in Afghanistan. In recent years, there has been a lot of media coverage about destruction of cultural heritage in the countries under a civil war such as Syria and Iraq. In response to such situations, following the symposiums “Rebuilding in Syria and the Cultural Heritage” held in October 2013 and “Towards Safeguarding of the Syrian Cultural Heritage” held in June 2014, the international symposium titled “Cultural Heritage and Conflict: Protection and Rehabilitation of Cultural Heritage in Conflict and Post-conflict” was held at the National Research Institute for Cultural Properties, Tokyo on January 24th, 2016. This symposium welcomed experts who were working at protection of cultural heritage in Afghanistan and Iraq. They spoke to us on the cultural heritage protection activities implemented in their countries thus far, critical situations that they now face, and the international support required now and in the future. The activities to protect cultural heritage that have been conducted in Lebanon, Syria, and Iraq by Japanese experts were also introduced. The symposium was attended by more than 100 participants and the contents of the presentations were reported by various mass media, reflecting a high interest among people in protecting cultural heritage under the conflict. The Japan Center for International Cooperation in Conservation intends to continue its international contribution through various matters related to cultural heritage.